This frothy scarf is one that many of us can use in our wardrobe. I love that Tamara worked it up in white yarn as it looks even frothier in white than it might in other colors. However, whatever works in your wardrobe would be the right color for you. Not seen in this picture, but displayed elsewhere on Tamara’s site is the adornment she created for her scarf, a crochet embellished button. If you’ve read many of my blog posts, you know I love buttons and love crochet projects that can showcase a single, stunning button. This project is custom made for that! Even better, Tamara offers this to us as a free pattern. 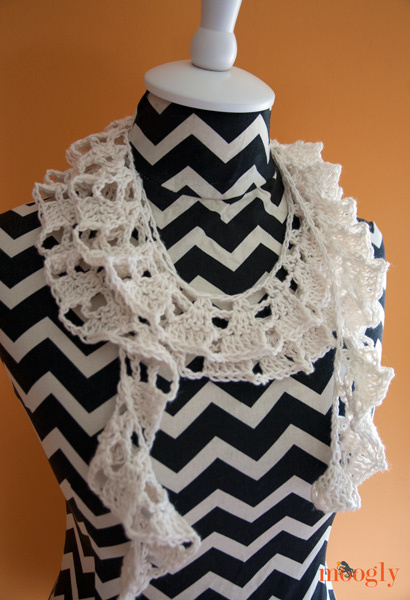 You can find it here on her blog along with other lovely patterns. Tamara offers a variety of patterns accompanied by tutorials, in both picture and video formats. There are a lot of good ideas here and plenty of inspiration. Hers is a site worth checking out!